It is rare for students to leave university and immediately begin work on a globally significant project. But thanks to the graduate program run by the project's Construction Management-as-Agent (CMA) contractor, MOMENTUM, that's exactly what is happening at ITER. Grégoire Daumy (26) and Coline Larcher (25) agree: the MOMENTUM graduate program demonstrates the value of providing inexperienced—but highly motivated—recent graduates the opportunity to show what they can do. There are currently five graduates working with MOMENTUM, with another two due to join early next year. Two former participants have already been promoted to important jobs on site. "We have benefited in so many ways from having graduates as part of our team," says CMA Project Director Angie Jones. "They belong to a generation that has grown up with digital technology, they are highly motivated, and they have brought us a refreshing new perspective and innovative ways to solve problems." The ideal profile for the MOMENTUM graduate program is a student who has finished a university or Master's program in engineering, project controls, or HSE (health, safety and environment) within the past two years, and who is highly motivated. "By joining our on-site program, graduates gain by developing their construction and project knowledge and have the opportunity to move into high-potential graduate or junior roles." Grégoire Daumy, 26, is one of them. He joined the training program after completing his Master's degree in nuclear physics; now he is construction coordinator for the cryoplant, where his job is to draw up coordination plans with contractors from different fields and cultural backgrounds and be a constant presence on site to ensure that the plans are implemented safely. Coline Larcher, 25, is about to step up to junior workface planner, having successfully completed her MOMENTUM graduate training. 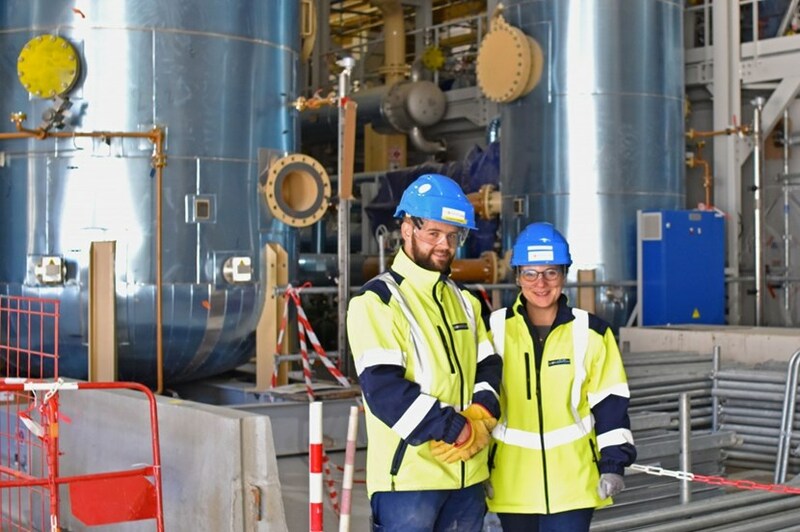 Coline, an engineering graduate, has been providing planning support for the project control team on change request management and for the Tokamak Complex construction team. As a workface planner, she will be giving guidance to contractors about their short-term work schedules. The four other graduates working on site for MOMENTUM are Solène Vailhen, assistant project coordinator; Charlotte Blache, mechanical engineer; Jieun Kim, document controller; and Guillem Monso, cost estimator. Past graduate Laura Bertolo has moved, like Grégoire, into the role of site coordinator. "MOMENTUM is very proud of its graduate program. It is starting to produce real benefits both for us, as Construction Management-as-Agent to a first-of-a-kind project, and for the ITER Organization," concludes Jones. For more information on MOMENTUM please visit this site. Candidates interested in the graduate program can contact either Celine.Pucciarelli@iter.org or Chloe.Aprin@iter.org.